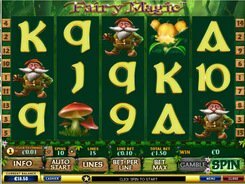 Plunge into the recollections of your childhood with the magnificent Fairy Magic video slot. Feel like a child, but keep in mind truly big cash to be awarded to you by a good fairy. The five-reel slot enables you to bet on any of its 15 paylines, and you get real chances of winning the grand prize of 10,000 coins. The top wager goes as far as $75, and the coin value can be modified from $0.01 to $0.5, which is a great offer for beginners. 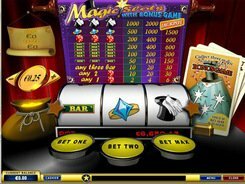 The Playtech-developed slot machine offers really magical features to increase your winnings. The unicorn, the wild symbol, replaces other symbols and multiplies the main bet. Five unicorns reward you with a fixed jackpot of 10,000 coins. A tree (the scatter) pays out your total bet multiplied by 10 to 500 depending on the quantity of scatters that have hit on any position of the reels. With each appearance of a Fairy symbol on the screen you get one magic star. Accumulate four stars and be awarded with a multiplier of 4x applied to your last spin winnings, and receive 5 free spins with double wins. After a winning spin you may get a chance of playing the Gamble feature. Select 1 of 4 face-down cards. After that the chosen card turns face up, and if it has a higher value than the dealer’s card, you may congratulate yourself as the prize of your last spin has just been doubled. You are allowed to play the Gamble feature till the bonus winnings reach a $1500 threshold. PLAY FOR REAL MONEY!